I’ve made a typo when invoking a script and was surprised by the result. I decided to investigate and tried to understand what just happened. Without further suspense, I did actually append a dot at the end of my script. Whoaaa, notepad opened the script. I didn’t get an error saying this file path doesn’t exist. I mean, instead of typing notepad c:\test.ps1, I’ll from now on type c:\test.ps1. But at some point, it starts doing something else (as you can see below). It starts examining my PATHEXT environment variable. In the first case, the CommandDiscovery correctly found that c:\test.ps1 is a script and invoked it. In the second case, the CommandDiscovery found that c:\test.ps1. is an application and started looking for an application that can handle this extension. If it finds a MRU list under HKEY_CURRENT_USER\Software\Microsoft\Windows\CurrentVersion\Explorer\FileExts\.ps1\OpenWithList (if you’ve ever double-clicked on .ps1 file), it will use it. Having parentheses around the variable statement also outputs the result in the console. Why there is such a difference? It also means that you can do both the variable assignment and test if anything assigned exists inside the if pipeline/expression. It will evaluate to $true if the output exists and to $false if it doesn’t. As far as I remember, some participants in the scripting games were also using this approach and Don Jones talked about it a few years ago (if you’ve a link please share it, I’ll add it). When you process only once the heavy workload, capture its result into the variable and immediately test if it exists, it also allows to write less code and have a slightly faster execution in memory. Using the above syntax, you can actually avoid writing more code. Let’s measure how fast each of these pieces of code run. I haven’t found better examples yet but you can try these examples. The first and second examples run almost at the same speed. I had the displeasure to start the control panel on my Windows 10 (1607) this Sunday morning and find an entry I didn’t know about and that I didn’t install myself otherwise I’d remember having done so. Being a sysadmin dealing with security, I immediately thought “OMG! My children running as standard users have been able to install a software that was able to do a privilege escalation despite the harden configuration I set up”. In less than 2 seconds, knowing exactly what registry keys have been queried to populate these entries in the control panel, I realized my kids who have been somehow trained about social engineering tactics,… wouldn’t have fallen in this basic trap and install something called “Windows 10 Update and Privacy Settings”. Sure, my 10 years old son was able to identify the following malicious tactics described in this article “Breaking down a notably sophisticated tech support scam M.O.” a few weeks ago before this article was published. Mystery solved. As you can see above, there’s URLInfoAbout that points to http://support.microsoft.com/kb/4013214 and it’s not a fake. Knowing also how to find other footprints of this installation in the registry, I was able to identify where the msi file is stored on the disk. My friend and fellow CDM MVP François-Xavier Cat asked early February if anybody wanted to work on the newly announced MVP API. If you’ve updated your Windows computer and use the Stop-Computer cmdlet, you may have noticed that it doesn’t work anymore as it used to. 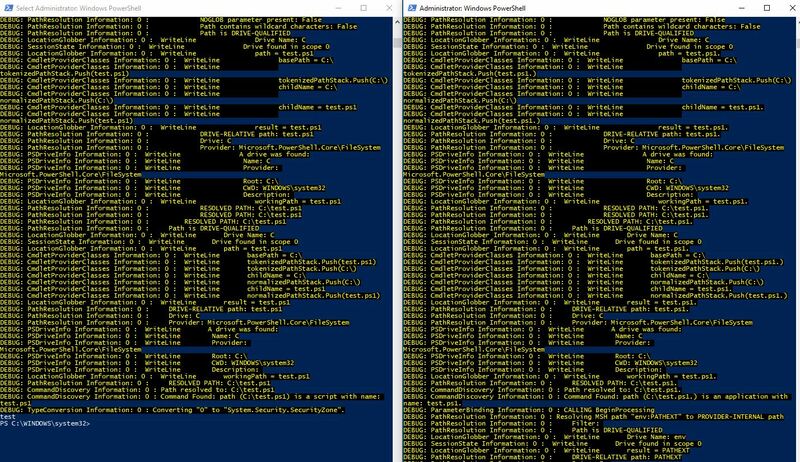 This was quickly reported to this reddit thread and a PowerShell team member, Steve Lee, quickly answered that the culprit is actually a .Net update introduced in April. I must add that WMI is also impacted by this regression. Using the brave old Win32Shutdown WMI method has the problem as the Stop-Computer cmdlet. I must also add that the problem isn’t only present only on Windows 10, any Windows that had this .Net update is currently affected.